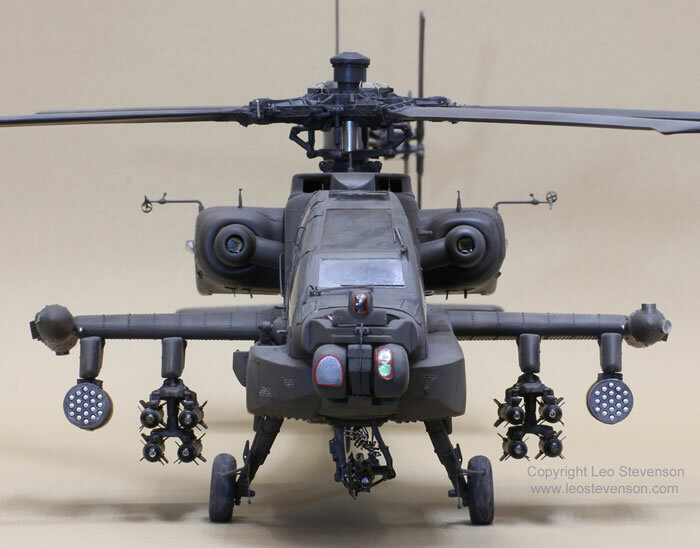 I'm sure I can’t the first person to think that the Apache helicopter is very sinister and predatory looking, like a particularly nasty insect, and yet, strangely, at the same time it also has an alluring shape. As I am mainly a modeller interested in WW1 aircraft (q.v. my FE.2b on this website) sometimes all those struts and rigging leave me desperate for a change, and as they say ‘a change is as good as a rest’. I am half Dutch, and so this change took the form of an AH-64D Apache of the Royal Netherlands Air Force. I decided to depict one as seen on active service in Afghanistan in 2009. This particular aircraft was part of 301 squadron based at ‘Kamp Holland’ on the outskirts of Tarin Kowt, Uruzgan province, whilst working as part of NATO’s contribution to Operation Enduring Freedom. I only build models in 1/32 scale; it’s a stubborn foible of mine because I like to have consistency in my collection. 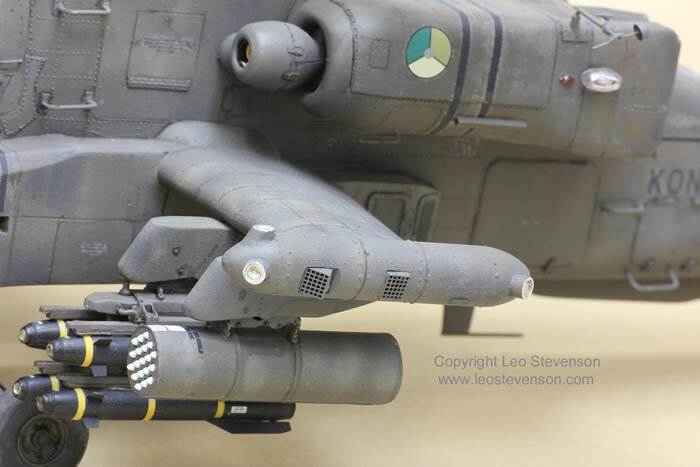 This meant that at the time I built this model (2010) my options were very limited, and as far as I can tell there is still no currently manufactured 1/32 AH-64D Apache available. 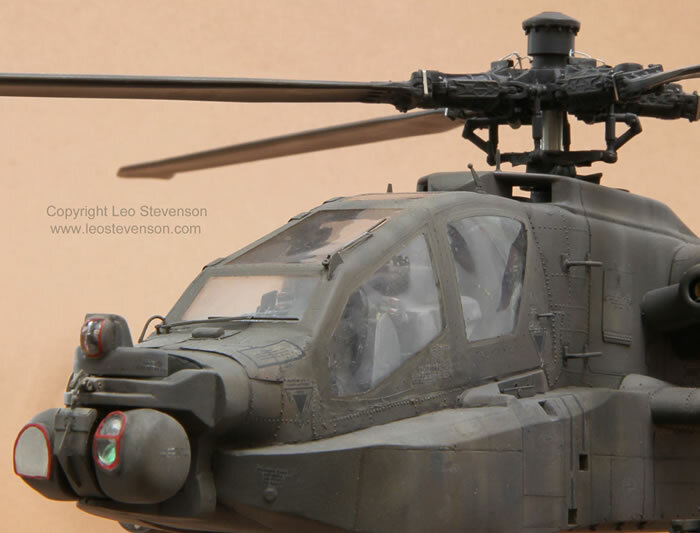 This model is based on the old 1/32 scale kit of the AH-64A by Revell. This conversion involved a lot of scratch-building and a number of after-market items to bring it up to date. 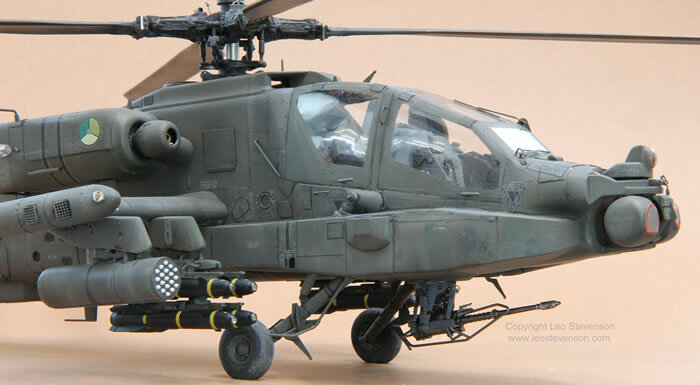 My initial inspiration for this project came from the decals for a 1/32 AH-64D marketed by Dutch Decals when, as far as I knew, no one actually made a kit of either that version of the Apache or one flown by the Dutch air force! I just had to make one, so I decided to convert this old Revell kit, but it was only after I started work on this that I realised that the more I researched this the more apparently different this aircraft is compared to either the British or American Apaches. Well, I started, so I had to finish. The photos you see here are of the finished item because I didn’t take any photos during construction (sorry! ), but I hope these words will give you an idea of what this exercise entailed. The photos were taken at different times and under slightly different lighting conditions, so please excuse the colour variations in some of them, these do still represent the same model! The main change to the shape of the beast is in the enlarged and altered sponsons along the sides and front, because the ‘D’ version has far more avionics and equipment in these areas than the ‘A’ version had, and they were accordingly expanded out, up and forward, and steps were also built into the port side (to allow access to the ‘dog house’ area and rotor hub). These sponson areas of the model were altered by a combination of plasticard and epoxy resin fillers, all cut, carved, cudgelled and cajoled into shape over the shorter, smaller and shallower ‘A’s sponsons. The other main change to this kit was to scratch-build the ‘AMASE’ pods for the ends of the winglets; these devices are very sophisticated self-protection system against missile threats, and they are only found on RNAF Apaches. These pods are part of the extraordinary survivability equipment that these Apaches carry, and these features along with its formidable armament really do make it seem more like a flying tank than a helicopter. I turned the basic shape of these pods on a lathe, and then drilled large holes in them and added various bits of plastic and aluminium tubing for the ‘plume detectors’ and sunk in little mesh-ended boxes that I had made to simulate the flare/chaff dispensers, and both the plume detectors and the chaff-flare dispensers were smoothly fared into the main shape with epoxy resin filler and made good. I added the various large Frankensteinian rivets using tiny blobs of superglue, but that didn’t come off as well as I’d hoped, nevertheless it gives the right impression of the real thing if you squint your eyes (!). Another feature of RNAF Apaches is the round capped shape on top of the rotor hub, which is the stub of a Longbow radar device which wasn’t needed in Afghanistan because the Taliban don’t have any tanks or aircraft (yet). I made this from a rod of polyurethane resin that I turned on a lathe. 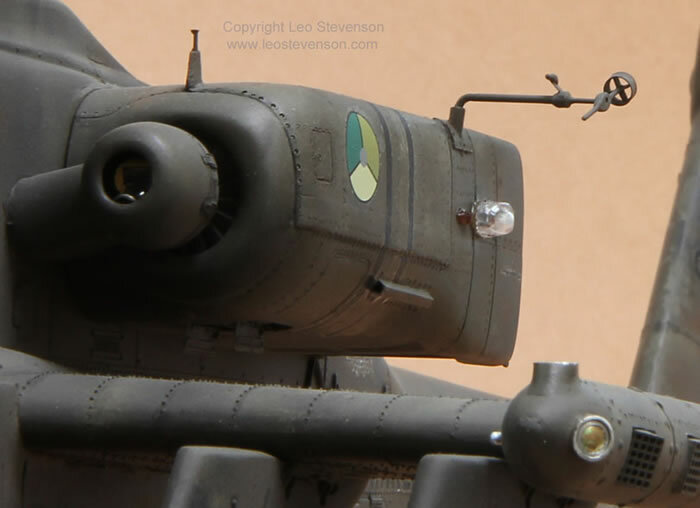 The ‘TADS’ system on the front of the Apache was improved on from the rather crude bits supplied with the kit by hollowing out the kit parts and inserting small metal discs (actually sequins!) to represent the lenses of this device, and then, over the lower one, adding a disc of an iridescent transparent film called ‘iridescent wing film’ from www.fairytasia.co.uk . This film is normally used for making fairy wings, and I don’t mean Fairey Swordfish wings! I’ve also used this amazing material to make the lenses on the plume detectors on the ‘AMASE’ pods and the ‘PNVS’ lens on the front of the aircraft, and it has other uses on other models as well, for example to make the clear screens of the HUDs in the cockpits of jet aircraft, where that iridescence really adds to the realism that otherwise can only be inadequately hinted at with sprays of thin clear green paint. Another challenge was to scratch-build the swivelling ‘air data sensors’ that stick out on booms at right-angles from the engine nacelles. The rear part of these were made from a section of brass tube that was thinned right down, and this was slid over and glued onto the rear portion of these sensors, which were hand-made from bits of polystyrene carved to shape, with tiny squares of plasticard to make the fins to connect it to the tube section. These air data sensors and their booms are incredibly delicate and I snapped them off several times whilst handling the model, something that did not make me burst into fits of hysterical giggling. This model was also improved by adding a large amount of after-market items, including various access hatches, the very delicate windscreen wipers, the mesh in front of the tail rotor gear housing, and seatbelts from the Eduard set (ED32555, marked as “1/35 scale”, meant for a Kangam Apache kit that I’ve otherwise never come across). 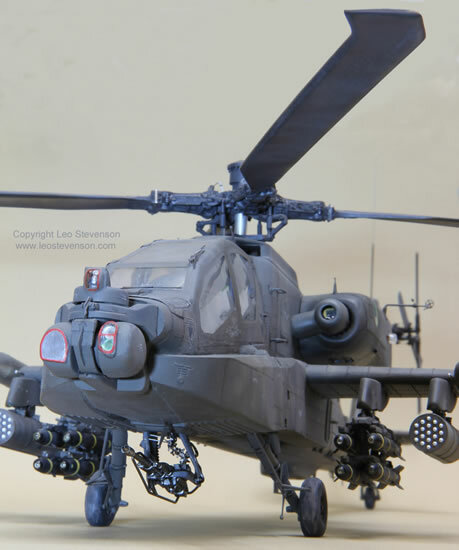 I also used the set by Eduard for the AH-64A (32098) and sets of photo-etched and resin parts by Verlinden Products (VL2198) and Flightpath (FHGS3207). I used the best bits of each of these to improve the model, which really helped, particularly the cable cutters that formed part of the ‘Wire Strike Protection System’ and the Hellfire missiles in the Verlinden kit which are very nicely made. For the cockpit I used some kit parts but mostly I had to scratch-build most of it because the AH-64A is very different from the ‘D’ version. To do this I used various pieces of plastic card and rod etc. and made a sort of amalgam of these home-made parts with the Eduard Apache dashboard set (33012, also made for the mysterious 1/35 Kangam model) and for the screens and other devices I also cannibalised a set of cockpit parts made by Eduard (32556) for the F-18D jet. However, most of this work wasn’t worth the effort in the end because it wasn’t very visible on the finished model. This was made worse by the fact that the transparent parts of this model were slightly cloudy and remained so despite my best efforts to polish them up and make them more transparent with Micromesh polishing cloths. The very long whip aerial on the tail was made from thin brass tubing finished off with a length of guitar ‘string’ (actually a wire of course); number 13 gauge I think. Guitar strings of various gauges make excellent whip aerials on models because with the right gauge they look good (i.e. in scale) and they are very strong compared to other weaker alternatives such as stretched sprue. In fact they are so strong that whilst handling the model they are more likely to draw blood from you than break, as I know from experience. A word of caution though; use an old pair of wire cutters to cut guitar strings because the steel from which they are made is very hard and can eat little notches into the cutting edge of your tool. I flattened the wheels to represent the weight of this aircraft whilst at rest. The complex tube structures around the main wheels and the Hughes chain gun were scratch-built from brass rod because they were more accurate that way compared to the slightly clumsy and out-of-scale kit parts. Other additions included a short aerial on top of the ‘dog house’ area, wiring just behind the TADS, improving the navigation lights with drilled-out and painted bulbs, and different scratch-built aerials underneath the aircraft in the vicinity of ‘the canoe’ under the tail boom which houses the ground proximity radar and Doppler equipment. As well as adding a large number of items to turn this from an ‘A’ to a ‘D’ Apache, I also had to change remove several redundant parts and features, such as the tail boom chaff/flare ‘buckets’, the AVR-2A detectors, and other things too numerous to name here. The appearance of the very scary 30mm Hughes M230H1 chain was vastly improved with bits from the Eduard set, not least with the cage-like structure for feeding the rounds to the gun. On the winglets I added a full set of Hellfire missiles (from the Verlinden set) and also gave it a complete set of all the Hydra 70 missiles it could carry, although in reality this aircraft probably rarely if ever carried such a full load-out whilst on service in Afghanistan. I looked at one of these RNAF Apaches very closely when they had one at the RIAT air show in 2010 (and spoke at length with two of the crew who had been to Afghanistan). The RNAF Apaches seem to have a different overall colour compared to the British or American ones, so please forgive the artist side of me if I describe it as follows - it is a very grey-ish warm olive green, i.e. a very neutralised reddish olive green. I mixed this myself, using a mixture of Tamiya acrylics (Neutral grey XF-53, Dark Green XF-61 and Red-Brown XF-64, I can’t remember the exact proportions). I also used these colours in differing proportions to vary the colour of the surface because in service the very dull flat paint on the actual aircraft ages and fades unevenly and patchily into a variety of tints and shades. This model was then additionally weathered with light sprays of various greys and browns, and some areas were also stippled with very dilute paint applied with a bit of damp torn sponge. This is where things went a bit wrong for me. I thought I had glossed it up enough to accept the decals nicely and they seemed to go down OK, but when I applied the matting-down varnish I had terrible problems with many of the decals ‘silvering’ and generally looking fairly grim. By the time the matt varnish had been applied it was too late to use Microsol or any similar products to iron-out the silvering and so I had to laboriously touch-in around these decals with a very fine brush to tidy them up. This mostly worked, but not entirely. Basically, the problem was that I had underestimated the very textured surface of this model, and this conspired to trap lots of microscopic bubbles of air under the decals that I had thought I had avoided. Life’s full of lessons. These faults don’t distract too much from the finished model, and generally I'm very pleased with the result. So there it is, a RNAF AH-64D Apache [cue fanfare]. 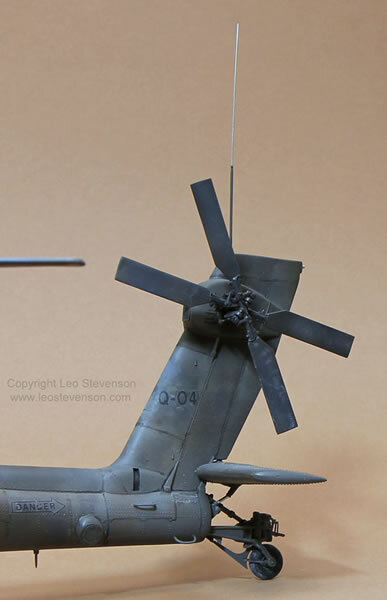 Now, after all that time and not a small amount of expenditure, I bet that there’ll be a manufacturer who’ll come out with a 1/32 AH-64D very soon that would have saved me all this effort! After finishing this Apache I had had my ‘rest’ and it was time to get back to modelling some good old Fred Flintstone technology from WW1, which for me remains all the more impressive since those boys were flying less than a blink of an eye since the first ever powered flight. The fine art of killing people gets ever more brutal and subtle, but that’s the nature of war and, sadly, a necessary part of protecting the freedom that most of us cherish. As with my paintings, in a small way my models are a tribute to those who flew or still fly in our name.